Rapid and significant global growth for the biologics division of a major pharmaceutical manufacturer brought a dramatic increase in regulatory inspections – and deficiencies in quality. Expecting unprecedented growth in number and types of new products in the coming five years, the division wanted to become best-in-class in overall quality in order not to jeopardize its operating license or its future. For help, they turned to Tunnell Consulting for an assessment of all aspects of quality across multiple sites and corporate headquarters. TUNNELL WAS ENGAGED TO ASSESS GLOBAL QUALITY AND GMP COMPLIANCE CHALLENGES AND HELP CREATE A SUSTAINABLE QUALITY-BASED CULTURE. The biologics organization had faced multiple pressures in many parts of the business, and rapid growth in the vaccines business had brought increased regulatory inspections. Expected growth in several products promised even more change ahead. And, like many companies, the division faced the inherently more complex challenges of compliance. In response, the division established a cross-functional Quality Improvement Team. Chartered to assess global quality and GMP compliance issues and recommend remediation strategies – with particular emphasis on prevention – they turned to Tunnell for assistance. Tunnell assembled a multi-functional team of highly experienced consultants in quality/compliance, biopharmaceutical manufacturing, lab operations and OpEx/OD/HR to conduct on-site evaluations at the company’s vaccine manufacturing sites as well as their corporate headquarters. This single, integrated team conducting the assessment across all global sites ensured a consistent approach and evaluation across the organization. And it facilitated the shared perspectives that are essential for creating a Quality Culture in which everyone, at all levels and in all functions, thinks and lives Right-First-Time and maintains a reliably high state of quality and compliance in all activities. OUR ASSESSMENT COMPREHENSIVELY ADDRESSED THE PROCESS AND PEOPLE ISSUES THAT TOGETHER MAKE UP ORGANIZATIONAL CULTURE. OUR ASSESSMENT UNCOVERED PEOPLE STRENGTHS THAT COULD BE LEVERAGED AND CULTURE CHALLENGES THAT NEEDED TO BE FULLY UNDERSTOOD AND TACKLED. 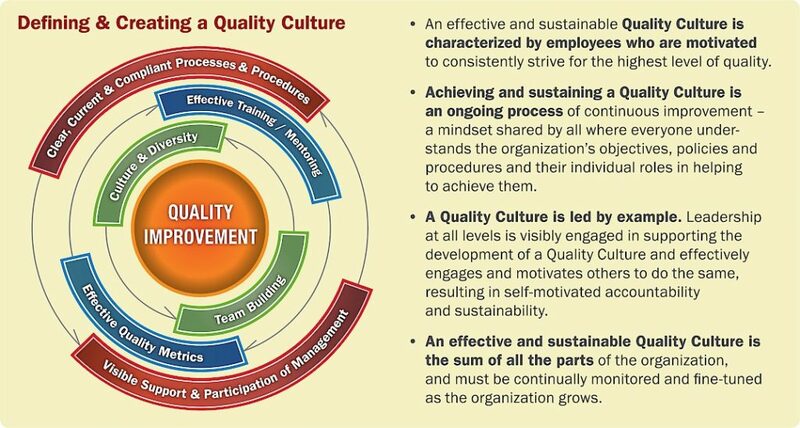 The assessment found broad agreement across the organization about many of the aspects that bear on Quality Culture. Employees felt good about what they do; they recognized the high level of scientific and technical expertise throughout the company, and they felt that it manufactured high-quality products. Overall, they viewed their direct managers and supervisors favorably; they knew how their work affected the quality of their products, and they felt comfortable bringing attention to potential non-compliant activities. Strikingly, barely a third of the polled staff at corporate headquarters and all but one of the manufacturing sites responded positively when asked whether the right behaviors were encouraged for sustaining a Quality Culture. 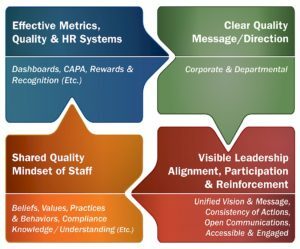 TUNNELL DEVELOPED RECOMMENDATIONS TO HELP THE COMPANY TRANSFORM ITS DISPARATE CULTURES INTO A POWERFULLY INTEGRATED QUALITY CULTURE. Based on Tunnell’s input, the client has begun implementing many of the recommendations that were made and has recently reported successful outcomes in each area including successful restructuring of their Quality organization and improved Quality Culture across the organization.